Arthroscopy is a modern minimally invasive procedure used for the examination and treatment of disorders affecting various joints. The survey is done in the operating room of the medical institution to prevent infection of tissues. Conducting arthroscopy allows to identify available joint pathological processes, to determine the rational tactics of treatment and to conduct a number of small remedial measures. As a rule, patients tolerate the procedure very well without any complications. What is arthroscopy? It is an endoscopic method for studying the state of the osteoarticular system, allowing the doctor to visually assess the condition of joints and intra-articular structures. The impossibility of determining the condition of the joint structures (ligaments, menisci, articular discs, etc.) using x-ray, CT and MRI methods. Suspected inflammatory or destructive changes in the joint space arthritis, arthrosis, bone fracture, etc. The violations of the integrity of the meniscus or cartilage surface. Traumatic and non-traumatic injuries of the knee ligaments. The need for removal of foreign bodies (pieces of cartilage or bone) or of the excess fluid from the joint cavity. Violation of matching the articular surfaces, etc. The doctor and the patient is advised to strictly adhere to certain indications and contraindications for the procedure. Anesthesia is impossible for any reason (individual intolerance to the components of anesthesia for patients, unavailability of equipment, etc.). The lack of mobility in the joint and of the joint space as a result of overgrowth of bone or connective tissue. The skin in the region of the joint with signs of inflammation and purulent infection (the skin has a reddish tint, revealed swelling, fever). Damage to the joint is open, which leads to the uselessness of the inspection. The presence of hemorrhage into the joint cavity. If the patient has no contraindications, it is recommended to refuse such examination and to choose similar methods. It is worth noting that many people are asking whether it is possible to do the arthroscopy with a monthly? No, menstruation is a contraindication to the use not only of this examination, but any other surgical intervention. Time 2-3 days before and after menstruation, and the menstrual period is not recommended to implement such procedures. Preparing for examination of any joint is the same. It is important to note that before the procedure, the anesthesiologist and the attending physician should discuss with the patient the examination process, possible complications and risks and feasibility studies. This allows you to improve the level of mental preparation of the patient. For one or two days before the examination the patient should undergo ECG to take common blood and urine tests, as well as a number of other studies, depending on the available diseases. On the day of surgery and the night before you must abandon food and drink liquids. Directly before the operation is carried out shaving the hair on the skin in the area of the procedure. Another important thing that you must do before your test is the selection of crutches or canes for the patient. After surgery him some time to walk independently. Early rehabilitation after arthroscopy allows to quickly restore the motor activity of man. Any kind of arthroscopic surgery, like any surgical procedure, is performed under the General anesthesia that is necessary for adequate pain management of the patient. Local types of anaesthesia are not shown. READ Where an x-ray to a child? 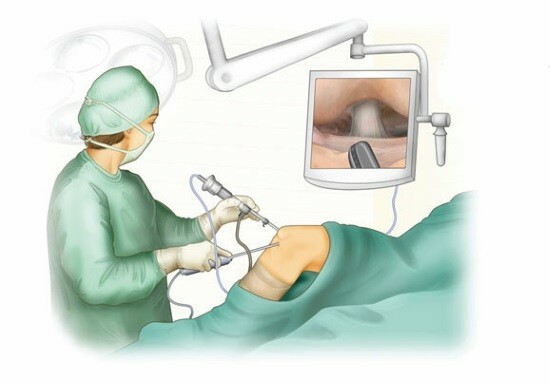 A survey carried out with the use of special tools arthroscope (a special endoscope with a video camera, light source and also can enter additional tools or suction to remove excess fluid), metal suction tubes, etc. 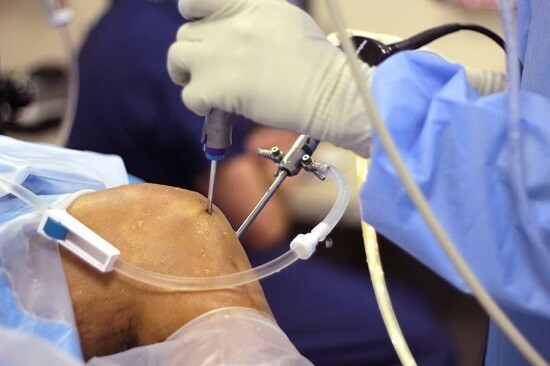 may Additionally use an arthroscopic probe, allowing the surgeon to physically move the tissue in the joint, increasing the scope of the inspection. The average duration of therapeutic arthroscopy – from 1 to 3 hours. Diagnostic procedure lasts a little less. The punctures performed in special points located at the boundaries of the joint. During the inspection of the joint cavity thoroughly washed with a sterile solution to remove pathological content and improve visibility. Synovitis – inflammation of the membranes of the joint, which may be associated with the violation of sterility. In case of breakage of the mechanical tools may be damaged and the synovial education. Violation of the integrity of blood vessels can lead to accumulation of blood (haemarthrosis). In the result of the injection into the joint cavity fluid or air may occur pinching the muscle and nerve tissues. Near the joints are blood vessels and nerves that can be damaged by the implementation of a puncture of the skin. When complication is required before the beginning of their treatment, since many of them can lead to violation of motion in the joint and lead to disability of the patient. After arthroscopy did, should begin early rehabilitation aims at restoring motor activity of the patient. The scope and procedure of rehabilitation measures depends on the volume of procedures, as well as human health. Early introduction of antibiotics after the study can prevent the development of infectious complications. The operated limb should always be recorded for its complete immobility. During the first days the patient should wear compression stockings to improve the flow of blood and lymph from the fixed extremity. At the time of rehabilitation should be abandoned from active exercise. 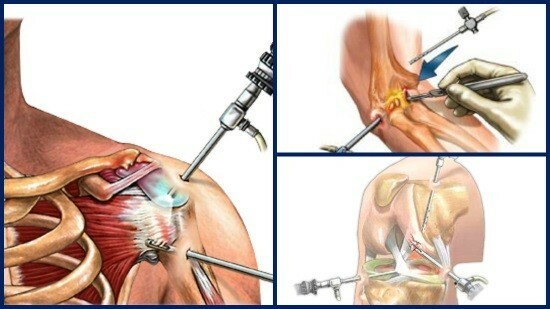 What is arthroscopy? It is a diagnostic method by which the doctor examines the health of the joint and the intraarticular structures also can conduct a series of simple surgical interventions. A similar procedure for the evaluation of the osteoarticular system is widely used to detect large number of diseases – arthritis, arthrosis, torn ligaments and meniscus. The risk of complications the patient is minimal, and the study itself takes a little time. MRI of the knee: what does as do?